Introduction: All the Year Round was a Victorian periodical, a British weekly literary magazine founded and owned by Charles Dickens, and published between 1859 and 1895. Edited by Dickens, it was the direct successor to his previous publication, Household Words, which he abandoned due to differences with his former publisher. After Dickens’s death in 1870, All the Year Round was owned and edited by his eldest son, Charles Dickens, Jr. This unattributed article on cable making at Silvertown was published in the magazine in 1875. 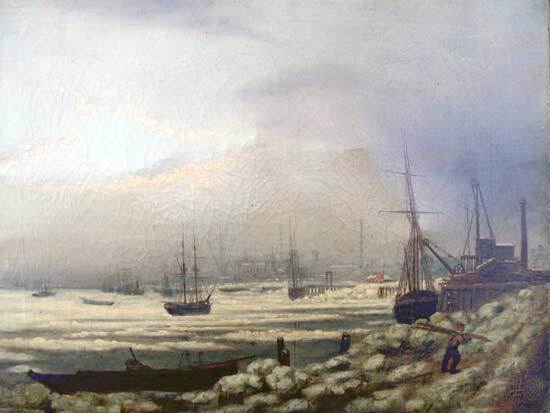 The image of the painting showing the Silvertown works from across the Thames was kindly provided by site visitor John Barnard. See also this page on the company, and this 1887 article. ON the edge of a marsh, in the dubious region between half fluid land and almost solid water, is the thriving colony of Silvertown. Overhead a brumous sky, underfoot artificial “terra” made “firma” by innumerable piles. Across the river, Woolwich, cheered by the presence of “the military.” Near at hand, useful but odoriferous gasworks, the gardens ruled by the Napoleon of caterers, a shabby railway station, and a pretty church. Not an old ivy-grown edifice this last, but a brand new, spick and span, smart and trim modern building rejoicing in its youth—proud of having been born yesterday. Out of a chaos of mud and slime have sprung neat lines of cottages, a grim hostelry yclept “The Railway Hotel,” huge wharves, and the seven acres of now solid ground which form the cause and explanation of the whole curious development. bank of the Thames, the Silvertown factory in the distance. 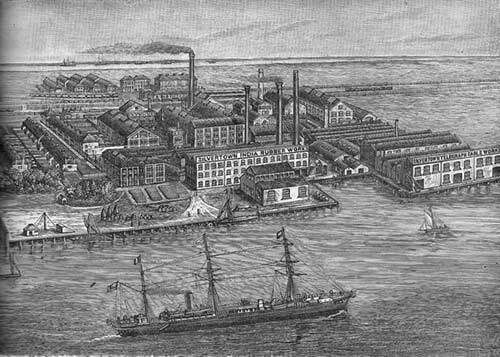 On these seven acres are closely packed great buildings, lofty chimneys, and frequent steam engines puffing and snorting in their usual self-asserting manner—bred of the conviction that they cannot be done without, and that their presence, repulsive though it be, must be endured for the sake of their power. There are endless contrivances here, for adapting abundant steam power to the use of man. Broad belts and mighty fly-wheels propel the minor engines, watched keenly by the craftsman’s eye, or guided by the workwoman’s cunning hand. For the productions of Silvertown are various: india-rubber sheeting, waterproof coats, valves and “washers” of vulcanised “rubber,” sponge bags, and those curious portable baths which Englishmen carry with them on their travels, to the amazement of less amphibious races; hard india-rubber, “ebonite,” as it is called, in buttons, bottles, caps, and funnels; and last, but not least, ocean cables, and the wonderful telegraphic apparatus for working and testing them. From its rough form as block or bottle “rubber,” the juice of the caoutchouc tree undergoes many curious mutations before it becomes a merchantable sheet. In a large building, filled with great iron troughs, and odours far from spicy, many men are at work on the rough rubber, which is first cut into pieces and then partially macerated and washed clean from impurities, emerging at length in the form of long strips of a dirty-white colour, not unlike fragments of unbleached Turkish towelling. It is now ready for the macerating mills, wherein it is worked up with hot water till it assumes the appearance of the chewed india-rubber dear to schoolboys. As the macerator slowly revolves, it squeezes from its capacious jaws a dark-looking viscid mass, only to seize it again and repeat the operation until the material becomes homogeneous, when it is ready for the cylinders. In these it is squeezed, under heavy pressure, through sieves of exceeding fineness, which take up every remaining particle of dirt or grit, and the rubber is now ready to be rolled into thick or thin sheets—or applied to cylinders under which pass miles of silk or cotton cloth, until, after some half dozen applications, a coating of sufficient thickness to make it waterproof has been deposited on the fabric—or to be cast in moulds into valves or buffers. “Washers” and such small deer are cut out of the heavy sheets, which are also employed for making the mats now so much in use. These are produced by a singularly beautiful process applied to sheets of vulcanised caoutchouc. This vulcanising operation is simple enough, consisting merely of the addition of a quantity of sulphur—often combined with colouring matter—to the wet paste of rubber, followed by baking in huge iron ovens filled in with lime. Charged with sulphur the rubber is rolled into long bands, of about half the width of the proposed mats. These bands pass on a travelling bed under a machine furnished with sharp cutters, which inflict stabs at regular distances, and finally cut off the band into lengths. These are next stretched on a frame so as to tear the wounds into almost lozenge-shaped openings, forming a perfect pattern; a process far superior in point of economy to that of punching out the interstices, and thus involving waste of labour and material. Stretched on frames, the mats are now duly baked, and on leaving the oven retain perfectly the form imposed upon them. To this process of vulcanising, rubber owes much of its adaptability to many uses of modern life. The addition of sulphur, followed by baking in lime, imparts to the material the power of resisting heat, and has extended the area of india-rubber goods to the torrid zone. Carried a step further this process produces ebonite, a material of great hardness and density, of which all kinds of articles, useful and ornamental, may be made: among which may be mentioned the cheap imitations of jet, which have the advantage of being far more durable than the hydro-carbon imitated. An entire district of Silvertown is devoted to the manufacture of waterproof clothing, vulcanised and unvulcanised. Here are stored huge rolls of material coated with rubber, and occasionally, in the case of very fine goods, supplied with an extra layer of fabric concealing the rubber entirely from view. Prettiest among these goods is a light fawn-coloured silk, coated first with rubber, which is then “sandwiched” by the application of checked silk, the result being the material employed for “reversible” coats and cloaks. In the manufacture of gutta-percha the processes are so similar to those employed for india-rubber, that they hardly merit a separate description. Cleansed, macerated, pressed, and rolled, the “percha” is cut into strips, nearly resembling hides in appearance. The employment, however, of this useful material has been much curtailed by its great increase in price. Only a few years ago there was a cry of “Every Man his own Cobbler,” and otherwise sane persons undertook to sole their own boots—an attempt attended with varying success, especially among those who could not be prevented from toasting their toes by the tire. These latter often found the experiment “come off” in a literal and aggravating manner; but the days of amateur boot-soling concluded with the scarcity of “percha,” caused by its profuse employment in the manufacture of telegraph cables. At one time it was proposed to apply “percha” to the arts, and it was shown that successful statuettes could be cast from this plastic material; but experience demonstrated that it perished on exposure to the air, and that work cast in it underwent a gradual process of deterioration. It may here be remarked that the long ocean telegraph cables have only one core, and that attempts to bind several cores in one cable have been definitively abandoned—at least for long distances. The twisted wire now passes away in one enormous length, to be coated with gutta-percha, and to that end is slowly dragged through a box Supplied with that material; the quantity taken up being reduced to an uniform thickness by the size of the aperture from which the core emerges. Cooled down until the percha has thoroughly solidified, the core is again and again dressed with coatings of waterproof, and after the third operation becomes a dark-coloured worm of barely half an inch in diameter, consisting of seven strands of wire, and three substantial coats of gutta-percha. At this stage it is stowed in tanks, exposed to various temperatures, and carefully tested at each—an operation of considerable delicacy, in which those scientific electricians, Mr. Gray and Mr. March Webb [see notes below], take great interest. Approved as a good sound core, it is now ready to receive the coating intended to preserve it from accidents of tension and abrasion, and from the determined incursions of marine animals such as the teredo. To this end it is swathed in jute, and “payed” either with the siliceous compound invented by Mr. Latimer Clark, or with a similar mixture, in which carbon takes the place of silica. The immense buildings devoted to this operation are rope-walks of no common kind. Entering at one end, the simple core, passing through a machine, receives its covering of jute, then, travelling onwards, is “payed” with the material just described; and next, without a break, undergoes one of the prettiest operations in the whole course of its manufacture. Whirling rapidly round are seven strands of heavy steel wire. Passing through these the prepared core is endowed with armour, heavy, close, and so accurately twisted, that the dreaded teredo may despair of finding a chink in the closely-knit mail. The cable is now a mighty steel-clad serpent, strong enough to encounter the perils of the deep sea, but is deemed worthy of yet more protection, before being consigned to the rocks and waves. Moving ever onward and onward, over the heads of workmen and spectators, our cable-kraken is once more clothed in jute and “payed” with composition, and its glittering armour, now covered by a sable surcoat, is wound off into mighty iron tanks, where it reposes till the ship is ready to carry it to its destination among the lofty hills and dales of the Atlantic basin, or the rugged declivities and gnawing coral reefs of Indian seas. The size of these tanks may be judged from the fact that three hundred miles of cable may be stowed in one of them without half filling it. Huge grew-some pits are they, containing many miles of cable, and much pitchy Stygian fluid, of hideous density and noisome odour. In its complete form a deep-sea cable is about one inch and a half in diameter, and weighs some five or six tons per knot; but these dimensions are greatly increased in the shore ends, which are strengthened till they are as thick as a man’s wrist, and their weight nearly doubled. These extreme precautions are rendered necessary, by the probability of accident at the shore ends from ship’s anchors, and also by the strain occasioned by steep inclinations and other peculiarities of a rocky shore. When the enormous weight and length of an ocean cable are taken into consideration, it at once becomes evident that the work of transferring it from the tank ashore, into the tank aboard the ship charged with laying it, is no common task. It is well managed at Silvertown. One of the vessels belonging to the company—for makers of cables generally contract to lay them, and deliver them in working order to the telegraph companies—is moored in the river at a respectful distance. Aërial tackle is fixed, and the lengthy monster, after being subjected to the most delicate tests, is ran overhead and coiled in the tanks—arranged in the ship so as to obviate, as much as possible, any undue strain upon a particular part. On the wharf overlooking the river are storehouses of the material required in laying cables. Here are iron buoys of all sorts, shapes, and sizes, furnished with neat contrivances for holding up cable ends and letting them go when occasion requires; regiments of barrels, employed for floating the heavy ends ashore in shallow water; and little iron testing-houses, made to take to pieces and pack in chests, with every plate carefully numbered, so that they may be put up anywhere in the shortest possible time. In these tiny huts the scientific officers of a cable-laying expedition house themselves and the delicate instruments used for testing and detecting the position of faults in the cable—serious matters, involving much picking up, cutting out, and splicing. Here also is an arsenal of grapnels for picking up, powerful machinery for under-running, and ample provision for meeting all the accidents that cables are heir to. The good ship Dacia, a veteran at cable-laying, is lying off the works; a stout iron screw steamer. At her stern is the simple machinery required for paying out a cable: a process easy enough in smooth, but not so pleasant in rough weather. The bow of the ship is occupied by a light iron staging, and the machinery for picking up a lost or defective cable—no light business at the best. In fair weather, however, the process of picking up and cutting out a fault, already carefully ascertained, is neat and pretty enough. By the agency of powerful clamps the defective portion is hoisted on board and simply laid across the bows of the ship, until, by continuous testing and careful examination, the fatal spot is fixed upon. Made fast on either side, the cable is now subjected to excision, the sound ends are brought together, perfectly brazed, and spliced; and the cable made whole is once more thrown overboard. During the whole process of cable-laying, which proceeds with the greatest regularity, and without those “kinks” which to the uninitiated would seem inevitable, the scientific corps is constantly at work, testing and testing again the continuity of communication with the shore. The instruments employed are of the most extreme delicacy, and at Silvertown a special department is devoted to their manufacture. Far too dainty for rough work, but invaluable for testing from the shore, is the electrometer invented by Sir William Thompson, of electrical fame. This consists of a needle suspended by a silken thread, and furnished with a small mirror, which flashes its record upon a scale placed opposite to it. A modified form of this beautiful instrument is now almost universally used for the ordinary purposes of ocean telegraphy. It was found that the older system of printing off dots and dashes involved an expenditure of electrical power highly detrimental to the cables—in fact, burning them up with excessive use. It therefore became an important object to secure some method by which the maximum of work might be achieved by the minimum of electric force; and, thanks to the suspended mirror, messages may be sent for thousands of miles with the force derived from three simple cells. Instead of printing off the dots and dashes of the Morse system, the alphabet only is retained, and the dot is indicated by a slight deflection of the mirror to the left, and the dash by a similar movement to the right. Nothing can be easier than to read off a message in this way, and the saving in wear and tear of a long cable is immense. Many more interesting features are to be found at Silvertown—as truly a product of capital applied to industry as Saltaire itself—but a short winter’s day is nearly over, a thousand workpeople are forsaking the busy spot, and the visitor must perforce hasten to the train for Fenchurch Street—perhaps the gloomiest and most uncomfortable spot in London on a chilly winter evening. See this addtional information on Robert Kaye Gray. E. March Webb was later Electrician-in-chief at the Silvertown Works. In 1879 he made a presentation to the Society of Telegraph Engineers on the laying of the Marseilles-Algiers cable..
All the Year Round, A Weekly Journal. Conducted by Charles Dickens. No. 326, New Series, Saturday February 27, 1875.